Here is a list of the most Frequently Asked Questions (FAQs). If you cannot find the answer to your problem, feel free to contact us using the contact form. The website does not seem to be working on my computer. What are the computing requirements for Signing Savvy? I can't see the sign videos. It takes a long time for the video to play. I can’t hear sound when watching the videos. Is there a way to clear the pop-up suggestions or auto-complete feature when I search the Signing Savvy dictionary? How do I print signs? Printing of signs isn't working. I can't seem to login on the website. I can't seem to login on the mobile app. I login but the site keeps logging me out. I recently became a member but I do not seem to have access to the full member features. Can I use Signing Savvy anywhere? Can I share my Signing Savvy membership (account)? Do you have a recommendation program? Why is there a cost for Signing Savvy membership? Do you have larger videos of the signs? I can't find a sign. I think the Signing Savvy dictionary has the wrong sign for a word. How does the phrase builder work? Is it an interpreter that will translate English to ASL? There are multiple sign variations for the word I want to sign, how should I sign it, which variation should I use? I want to learn to sign. 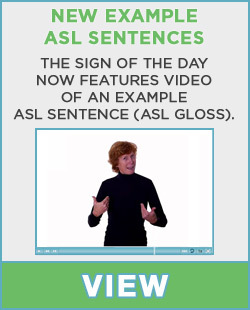 What is the best way to use Signing Savvy to learn sign language? What type of signs does Signing Savvy include? Does the Signing Savvy dictionary contain strictly American Sign Language (ASL)?